Because especially in recent years and with a shortened hype cycle, I'm always a little bit wary who an artist will support, either explicitly or implicitly... and I'll freely admit I do judge some acts by the people who sponsor them or they choose to sponsor - and in today's day and age, it seems like the list of disappointments keeps piling up. Yeah, in an attention economy, one's word tends to matter more than some think. But in the case of an artist who moves with integrity, I'm inclined to give them a bit more space and benefit of the doubt, so let's talk again about Uncommon Nasa, a New York underground hip-hop artist who has made my year-end lists multiple times and has delivered some phenomenal records both as a writer and producer. So when he approached me about a project he entirely produced for a new group called Last Sons, featuring UK rapper Duke01 and DJ Furious P, I was intrigued, especially considering how his production style has evolved and thus far he has not put his name or word behind a bad artist - and when you count how many guests he had on 2017's Written At Night, that says a lot. And I reference that project because that's where I got my first taste of these guys on the song 'Small Change', which was a great song and I had to hope they'd deliver here, so what did we get on Chekhov's Gun? Well, it wound up sounding pretty great, and I've been consistently having fun with this, but if you're expecting a traditional Uncommon Nasa project in terms of bars or production, you might be surprised by this - mostly because while his production is always layered and cacophonous, this album as a whole feels more straightforward. Part of this was inevitable with Duke01 taking more of the driver's seat in terms of bars, but as a whole this project feels more aggressive and kinetic without necessarily sounding heavier or grimmer, which is a departure from projects like Written At Night or Autonomy Music with Short Fuze. As such, it might be one of the most accessible projects to come out this subsection of indie hip-hop in some time. And let me make this clear: because of the content, I'd argue that was absolutely the right decision, because while there's been political text and subtext in Nasa's projects before, Duke01 is pushing this in a much more contentious and explicit direction... which means I get to bring out my three P's for good political art: power, precision, and populism. 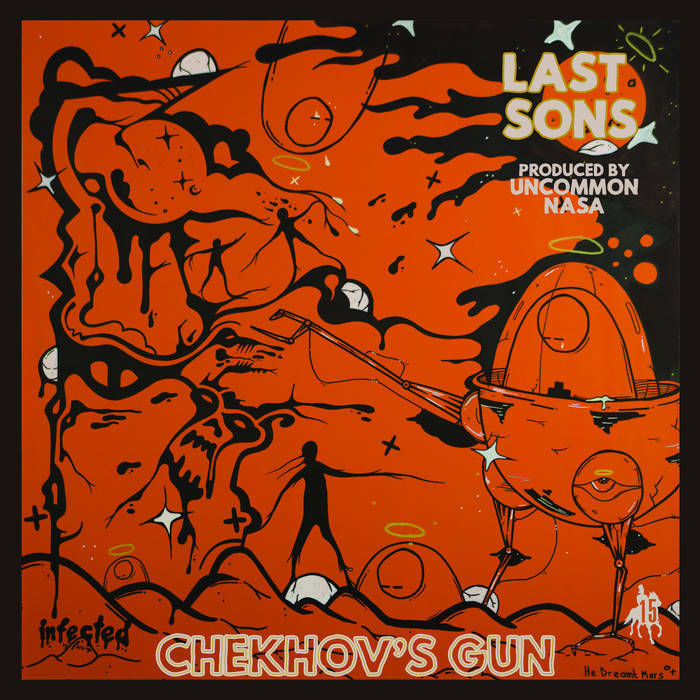 And for the most part, it's hard to deny that a focus on more direct topics and storytelling allows Chekhov's Gun to consistently deliver across the board, especially for as in-tune and anti-corporate as this album can feel. And sure, the dystopia of 'Welcome To Corporatonia' might feel a bit obvious, as well as the criticisms of customer data exploitation on '21st Century Power (Digital Breakdown)' and the corrupted media apparatus on 'Phoney Plaguestation', but the devil's in the details for all of these tracks and the biting slices taken at online fascism on 'Technicolor Terror' and white nationalist movements on 'Bright New Yesterday' feel all the more relevant today. And what was refreshing was how much Duke01 didn't really shy away from showcasing monolithic but vulnerable systems, and thanks to Nasa's production and Furious P slicing the samples to ribbons, showcasing how fractured and compromised some of those systems might be - take how so much of the melodic tones behind 'Phoney Plaguestation' sound like old TV news intros, all amidst how Duke01 showcases the corporate interests behind news story prioritization, language, and how it's built to reinforce our existing biases rather than challenge them. Or take '21st Century Power (Digital Breakdown)' - I'm always a little wary of songs that tackle the data economy, given my expertise in that field given my other job, but the presentation is a bit more balanced, more on how corporations will use data to offer convenience or even a voice to those deprived of it at the expense of privacy. But the second half of this album is where the content really snaps into place: 'Technicolor Terror' is a great showcase on how proto-fascist movements rewrite historical trends and traditions to fit their prejudices and further inflame blind rage, and 'Bright New Yesterday' shows how the same nationalist spirit within the U.K that might had a place against the Third Reich has been perverted by propaganda - and Nasa goes further on his verse highlighting the distractive tactics of authority to deflect from confronting their culpability in racial prejudice, and how just waiting for it to die out is not a solution - it wasn't in the 80s, it sure as hell isn't now! Now I'll freely admit i was most drawn to the political content first - Duke01 has a flair for detail and Nasa has never been one to pull punches with a lot of dizzying intensity, but there are definitely cuts where straightforward bars are just as entertaining. While I wish the vocal blending and fidelity was a bit more cohesive on 'Champion' with Short Fuze and Barrie McLean's hook - the latter of which probably needed a few more layers to fully work - all the verses were distinct and potent, and the title track followed suit in showing how much their words can indeed be weapons... but on the flip side you get 'Morphine', which dives into a conflation of hip-hop with drugs and the music industry that doesn't shy away from the addictive high but also the grubby, all-consuming withdrawal and lows. And I'll say it: the closing track 'Actually Happening' might be the bounciest song I've ever heard coming from Duke01 or Nasa - a little alarming given how utterly apocalyptic it is, as systems and humans fail in graphic detail! Not the first time that is referenced on this album - Nasa sees many of those same fractures on 'Champions' - but insanely catchy and a great way to close out the project. And while we're here, let's about Duke01 specifically as an MC: I'd argue in the current climate his British accent doesn't overpower his content the way it can for other U.K. MCs, but I will admit I had to request a copy of the lyrics just so I could ensure I didn't miss anything amidst fast flows and dense production. And if I were to nitpick him, it'd come here, because for as good as his sloganeering can be, he's got a tendency to let his bars pile up rather than hold back to draw emphasis - a bit of a shame, given how vivid and striking his wordplay can be. But if I do have a larger criticism, it might come in some of the production - and this can be pretty consistent from me with Uncommon Nasa, in that for as dense and claustrophobic as the samples and scratching, there'll be tones chosen I just don't like as much as others. For instance, the blaring, quasi-chiptune synths that slice over 'Megaton Blast' feels unnecessary and distracting from the bars, as are the oily oscillations drizzled all over '21st Century Power (Digital Breakdown)'. More to the point, for as stentorian and heavy-hitting as this album is trying to be, you can tell Nasa isn't quite in his comfort zone the same way, especially when the production feels a little cleaner - I already referenced 'Champion' which is trying to be anthemic, but it doesn't quite seem to have the consistent body or development in the hook to really knock it out of the park. Which is exasperating to say because there are absolutely songs that have that... they just tend to be a bit more twisted and thorny and heavy, like the scratch-driven cacophonous crush of 'Welcome To Corporatonia' with the added echo, or that contorted discordant guitar bounce of 'Already Happening', or the flip side the shrieking echos of the vocal samples opposite the flat buzz of the guitar on 'Morphine', the muddy, warping grind of 'Technicolor Terror', and the damp, tropical murk playing around the lumbering hook and sample driving the title track. And don't get me wrong, I think Nasa's sound and Furious P's vital contributions lends this album a ton of distinct texture and a swagger I absolutely respect, and I think it's an interesting step to delve into cleaner tones - I just don't quite think it stuck as well as I was hoping. But still, I've been consistently enjoying this album and this is a promising and distinctive side-project. Duke01 absolutely proved his own here in content and bars, and while this style of hip-hop is never quick or easy to digest, this is probably one of the more accessible joints and a good way to hop into this brand of New York-meets-U.K. underground hip-hop. It's well-paced, dense without being impenetrable, and shows a lot of real progression - a few small missteps, but nothing that seriously detracts from it. In other words, I'm thinking an 8/10 for this and absolutely recommended - again, like with any Uncommon Nasa project this is tough stuff to process even for fans of indie rap, and the politics are not playing around. And yet given where we are right now... I kind of needed this - check it out!